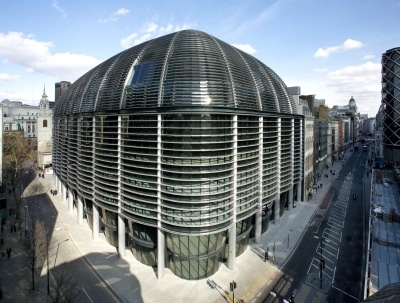 The Walbrook Building, developed on the previous Walbrook House, St Swithin's House and Granite House site, directly opposite Cannon Street Station, is a 10- storey steel-framed structure comprising 6,313 tonnes of structural steelwork. The building falls within the height limitation band imposed by St Paul's Cathedral, close to the remains of where the Roman Temple of Mithras was discovered in the 1950s. Its L-shaped floor plate is based on a 9m grid with only 10 internal columns on a typical floor plate, providing around 3,693m2 of retail space, plus 35,2832 of high quality office space, as well as two basement areas. The superstructure generally consists of structural steel columns and beams with composite floor slabs cast in-situ on metal decking with cellular beams used extensively to facilitate services distribution. Two atria from third to ninth floor allow increased daylight penetration into the office space. The frame is designed for a target maximum vibration Response Factor of six, while still maximising the areas of column free space and minimising construction depth. The extensive use of Fibre-Reinforced Polymer (FRP) solar shading is the first time that FRP has been used so extensively for a building, and will keep the building cool in summer. The floor plate design and long open spans create space suitable for the broadest possible range of occupiers and were designed to suit a financial sector tenant with provision for trading floors made on both the first and second floors. The most complex aspect of the job was the raking columns, which rake in mansard style up the height of the building. The columns change in inclination resulted in high axial forces in the beams which had to be considered as part of the connection design. Below the sixth floor the frame is based on a relatively simple beam and column layout, above floor six the members crank in multiple locations resulting in some complex nodes with members clustered at awkward angles. Where floor beams intersect the underside of the mansard cranks, the ends of the beams had to be double cut so as to match the different skews of the columns. Therefore, fabrication accuracy was key to ensuring a good fit up on site. The unconventional framing pattern meant that careful consideration was required to temporary stability above the sixth floor. 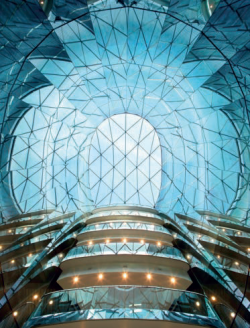 The roof level design was further complicated by the provision of a Building Maintenance Unit track (BMU), which had to cantilever over the curved face of the building resulting in large uplift forces and complex connections. The environmental impact of the building was a key consideration from initial design stage, with many features that allowed it to achieve a BREEAM 'Excellent' rating, with 38% less CO2 emissions than Building Regulations and a 4% improvement over the GLA target on CO2 reductions from renewable energy. This impressive building is a first-class example of steel providing the creation of a dramatic, yet functional, commercial building. Click here for a video case study of this project. Steelwork Contractor William Hare Ltd.
With large open trading floors and clear spans of 21m, this marks the latest in the design development of office buildings for the City of London. Progress has been evolutionary rather than revolutionary, but with ingenious construction methodology and refinements in fire engineering, this structure is impressively light, economical and efficient for the users. Further developing steelwork’s capabilities for offices.